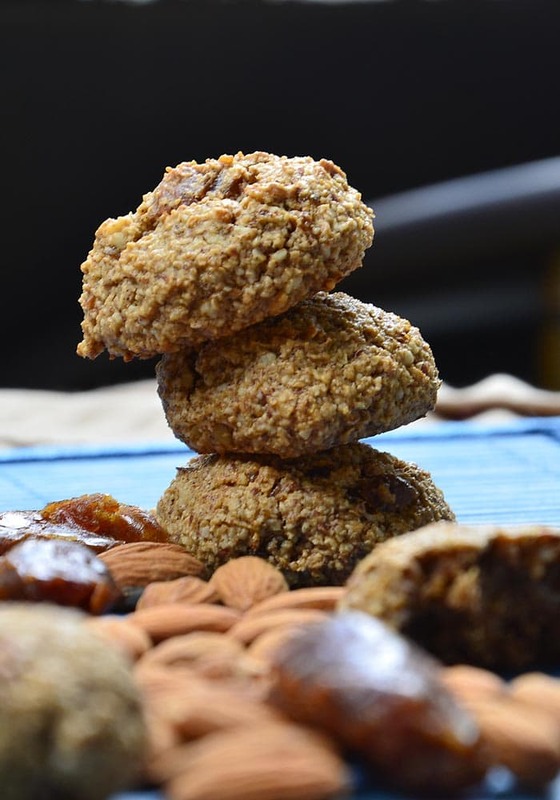 These vegan almond date cookies are made with dates, almonds, oats and coconut milk. They’re naturally gluten-free, have no added sugar and taste a bit like caramel thanks to the dates. Part of my food prep for this week was a batch of these cookies. These are fantastic to have on hand because they’re high in fibre and low in sugar. They work as a breakfast cookie, after-dinner treat or snack at anytime. You could even use them for a pre-workout fuel up! My husband asked if these had butter in them (which they don’t! ), so I think that can attest the rich, buttery taste of these little morsels. They’re moist and flavourful, warming and totally satisfying. Enjoy! 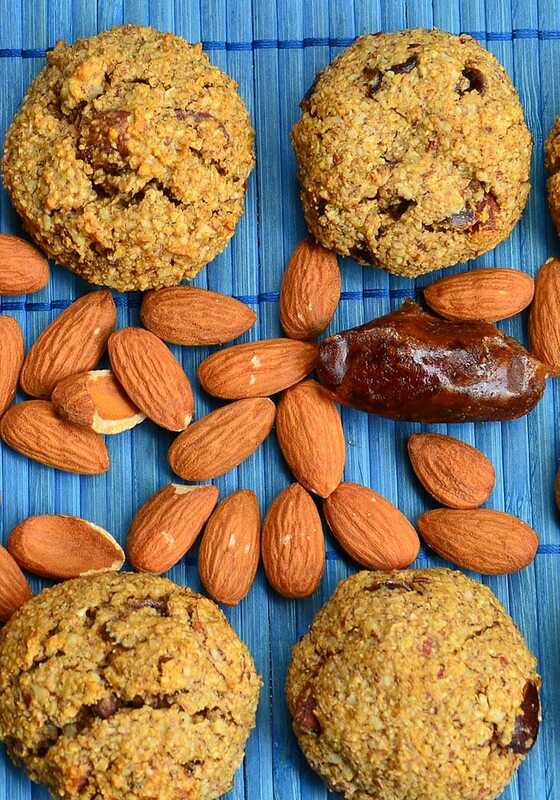 To make these cookies, you’ll need to grind up some almonds. You can do this in a food processor or blender. You’re looking for a grainy flour consistency. You’ll also want to make sure you use soft, fresh dates. If your dates are hard and dry, you’ll have to soak them in hot water for 15 minutes then drain before using. 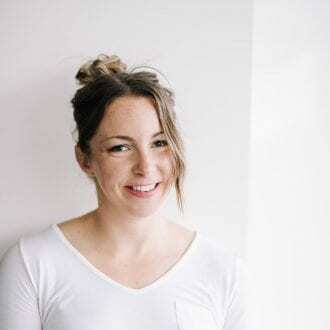 Other than the dates and almonds, you’ll need your baking basics such as baking powder and baking soda, some canned coconut milk and a bit of coconut oil. The result is a beautifully soft and comforting cookie that tastes like caramel and almonds. 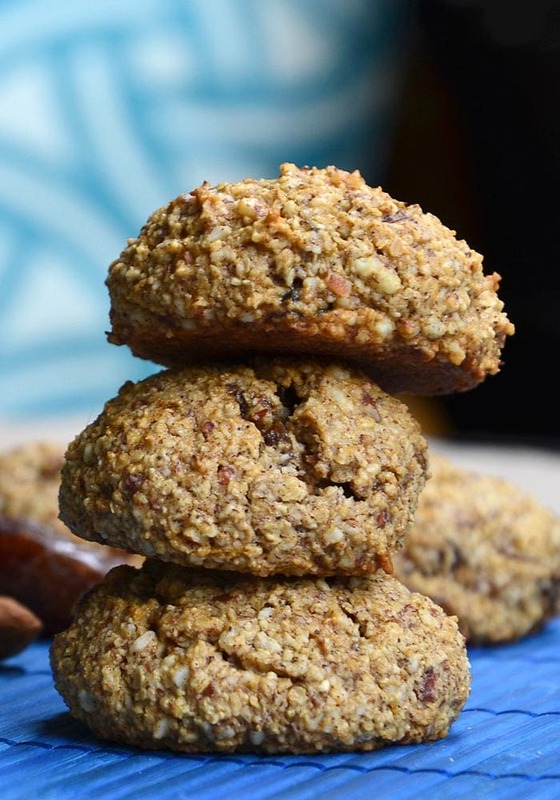 These cookies pack a ton of nutrition into one little delicious bite, plus with no added sugar they make a much healthier snack and treat option to be enjoyed anytime of day. Mix together all the wet ingredients in a separate bowl. Add to the dry ingredients and mix. 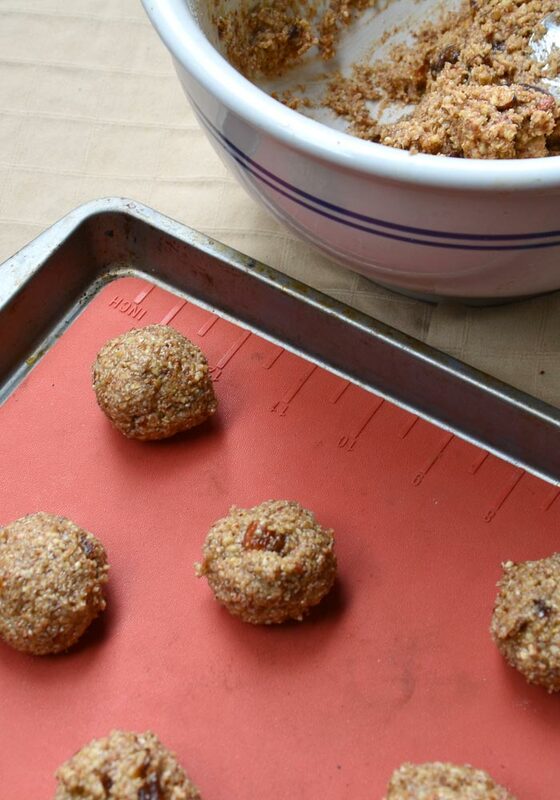 Place approximately 1-1 1/2 rolled balls onto a cookie sheet lightly oiled with coconut oil or lined with a silicon baking sheet. Press down lightly. My batch made 16 cookies. Let cool completely and store in a container in the refrigerator. Thanks Gabby!! Let me know how they turn out if you make them! I have been in the same boat Deryn. I am looking forward to having this upcoming weekend at home, and I will definitely be making these cookies! Thanks for sharing the recipe. Enjoy the cookies if you make them! can you use the non-canned coconut milk or does it have to be canned? Hmm, I’m not sure how that would work. I would probably stick to canned coconut milk since it’s a much different consistency and has a higher fat content than milk from a carton. These turned out delicious! I went and added a tablespoon of Blackstrap Molasses and some Allspice and Ground ginger. I’ll be making these again. Thanks!! Ooo, that sounds so yummy!! I forgot about these cookies – I need to make them again too! Love the idea of using no sugar! Definitely going to give these a try! I tried this recipe and while the flavor was good, the texture was dry and crumbly. Could you please clarify a few things, please? 1. The recipe calls for finely chopped dates and almonds, but the pictures show them roughly chopped. Have you proved the recipe both ways, and if so, which generated the best result? 2. For the “ground raw almonds” and “ground quick oats”, did you measure the whole ingredient, then put in a grinder? Or grind and then measure? 3. Is there a significant textural difference between grinding whole almonds and using almond flour? 4. Did you stir the coconut milk up or use the fattier cream that settles out in the can? 5. 20 minutes of refrigeration didn’t make a significant change in the temp of the batter. What temperature should the batter be prior to baking? I’m sorry the texture didn’t work out for you. 1. I’m not really sure, both should work ok. 2. I know I measured them before putting them in the food processor. 3. I can’t say how it would out with almond flour, it’s A LOT finer than ground whole almonds though. 4. Shake the can well before using, so you’re using all of the coconut milk, not just the fatty part. 5. I believe putting it in the fridge just allows you to handle the dough better. Sorry, I haven’t made this recipe in a few years so I’d have to make it again to double check the process. I hope that helps! I LOVE this recipe! It is simple, especially is you have a blender or small food processor to make it go even faster. I’ve become a proud vegan and these cookies have become my favorite go to baked good. I’ve made them 6 times in 5″6 months now. I love that there is no added sugar, just wholesome good quality ingredients. They are perfect for breakfast or as a snack or dessert. I can’t recommend these enough! P.S. I didn’t have any vegan condensed milk so I just used my coconut milk straight from the fridge…didn’t make any difference ? Thanks so much, Eileen! I’m so glad you like them. I was just looking at this recipe the other day, I need to make them again!! Thanks for the feedback. Taste good but my dough was a little crumbly, making it difficult to form balls, and the cookies also are crumbly. Any suggestions? Shoot, so sorry they didn’t work out for you! Did you measure everything exactly, refrigerate the dough for 20 minutes and melt the coconut oil before using? Another reason would be the dates you used. I used very fresh, soft dates that help to hold the dough together. I should update that in the recipe. If your dates were very dry that could have had something to do with it. I’m really sorry to hear these didn’t work out for you. Did you follow the recipe exactly and measure accurately? I’ve made them a number of times with no problem so I’m not sure what went wrong for you. Sorry for the wasted ingredients. Really good recipe. To address brittleness, my sister said that she used chia seeds soaked in coconut milk as a binding agent which solved the issue.